Mount Paektu - also spelled Paekdu (백두산 in Korean) and referred to as Chang Bai Shan (长白山) in Chinese, is an active volcano in Korea and a sacred place on the Korean Peninsula. The lake in the crater of the volcano is Lake Chon (천지 in Korean, meaning Heaven Lake). It is deemed the place of origin of Korean people. The legendary founder of Korea, King Tangun, was born to the son of a god (Hwanung the son of the god Hwanin) who descended from the heavens to Mt. Paektu and where he married a bear turned into a woman. King Tangun then founded the first kingdom of Korea, Kojoson also spelled Gojoseon (meaning Ancient Choson). You can read more details about this myth on our King Tangun Tomb page. Other kingdoms that followed such as the Koguryo, Balhae, Koryo and Choson dynasties considered this a sacred mountain and had rituals for it. Mt. 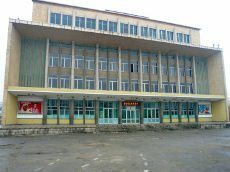 Paektu is also the place where DPRK President Kim Il Sung fought against Japanese occupation and where General Kim Jong Il was officially born. There are many pictures and murals in the DPRK showing the leaders standing at Mt. Paekdu as well as showing the cottage where General Kim Jong Il was born and of Kim Jong Suk fighting Japanese soldiers. Image of a bench used by President Kim Il Sung. 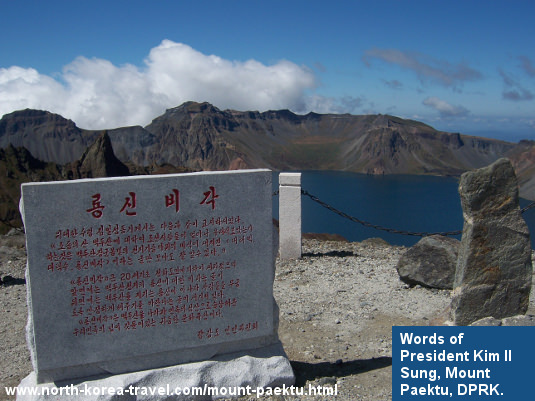 Mount Paektu is the highest mountain in Korea with a height of almost 2750 metres. 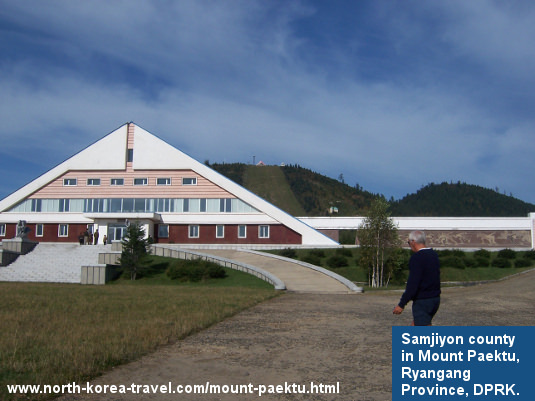 Located in Samjiyon County in Ryanggang Province in the north of DPRK, it borders China and part of the mountain is located in China. Paektusan boasts having the world’s deepest mountain lake with its deepest point recored to be over 380 metres deep. This military base was used by Kim Il Sung when fighting against the Japanese. Paintings of scenes of President Kim Il Sung and his wife Comrade Kim Jong Suk fighting the Japanese can be seen repeatedly over the country. There is too a very detailed wax exhibition section in the Korean War Museum where the secret camp is recreated. This area has too the Native Home of Kim Jong Il. 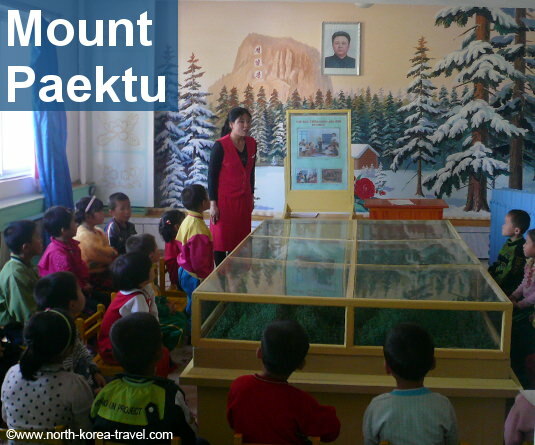 You can see pictures and paintings of this home all over the country as for example in the picture above taken of a Kindergarten class in a farm near Nampo on the west coast of DPRK, which shows how much importance is given to the place. Jong Il Peak is also located here and has the words "Jong Il Peak" (정일봉) carved in Korean (which can also be seen in the picture above). 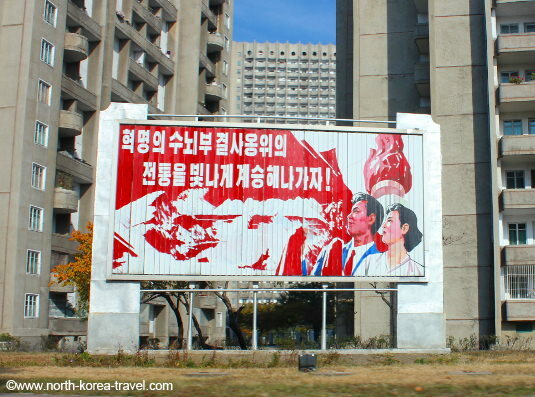 Image of a propaganda banner with Paekdusan in the background. A huge bronze statute of a younger President Kim Il Sung with a gigantic torch on its left hand side and a group sculpture of dozens of soldiers on the right, this is point is a combination of revolutionary propaganda mixed with the natural beauty the area has to offer. Samji Lake is a river turned lake a the result of the eruption of Paekdusan. There are views of the lake and of Paekdusan from here. This is where we stay overnight. The town’s houses are somewhat like from a movie depicting a ski resort in Switzerland. 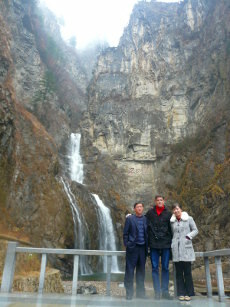 We arrange cycling tours in this part of North Korea. The biking route is 45 km long here. Please contact us for more information regarding this. Please click on our DPRK places of interest page to see what other areas you will be able to visit other than Mount Paektu on one of our North Korea Tours. 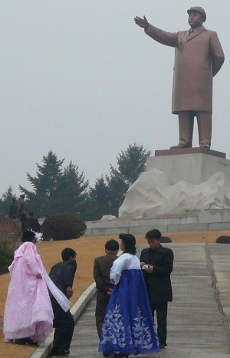 Newly married couple visit the statue of the Leader Kim Il Sung.